Enjoy the stunning shine and luxurious gleam of white gold, available for this beautiful pendant in either 18k or 14k. This stunning piece combines the beauty of fine white gold and the precious memories of loved ones with a black and white photo of your choosing. 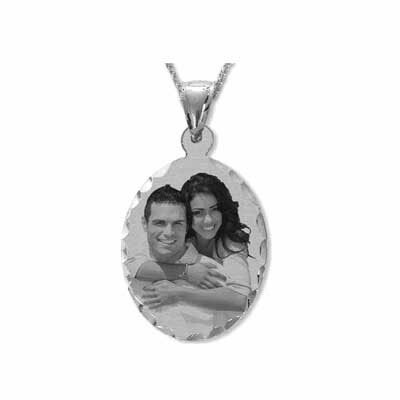 Show someone special in your life the love you have for them and give them the gift of beauty and elegance with the White Gold Oval Black and White Jewelry Photo Pendant. Get the perfect accessory and complimentary piece for any outfit- business, casual, or formal- and enjoy the beauty of this white gold pendant each and every day. Elegance meets simplicity and quality craftsmanship and it can be yours today- courtesy of Apples of Gold! We guarantee our White Gold Oval Black and White Jewelry Photo Necklace with Diamond Cut Edges to be high quality, authentic jewelry, as described above.